Successfully Added 10 Color LED Flashlight - Premium All Metal Torch Light to your Shopping Cart. 10 color LED flashlight with premium all-metal design for a multitude of indoor and outdoor uses. Illuminates your task area in 10 colors - white, red, green, blue, orange, purple, yellow, pink, light blue, light green. This powerful 3-watt LED torchlight is made of die cast aluminum and contains RGB color LED's that blend to give you ten vibrant colors (including white) with a wide beam in a static (fixed) or flashing mode. Designed with premium details and craftsmanship, this torch light is the perfect companion to keep in your car, home, garage, and with your camping gear. From the all weather rubber encased buttons to the slide-in battery pack (holding 3 AAA batteries), every facet of this flashlight has been constructed to provide years of reliable use. 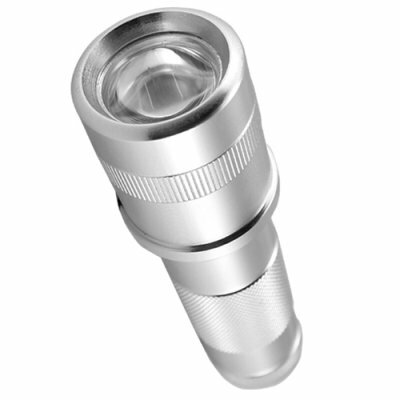 We are offering this LED Flashlight at a quantity of at least 2 pieces in order to give you the absolute best wholesale price and lower shipping rates. Buy one for yourself and give one to a friend or better still is to buy for re-sale on EBay, Amazon, or Ubid. Brought to you by the leader in direct from China wholesale electronics, Chinavasion. Designed with all-metal premium cast details and craftsmanship. Contains 3-watt RGB color LED's which will provide years of reliable use. Dimensions: 125mm x 32mm (length x diameter) - 4.9" x 1.25"
Can I get my company logo printed on this product? Yes, it is possible. Contact our sales department if you have a 100+ piece order and you would like this additional service. Is the CVGF-G24 an environmental product? Since it uses long lasting L.E.D. 's as its light source and it can be considered environmental. If you use this torchlight in combination with rechargeable AAA batteries you will do a lot to help keep harmful chemicals out of the environment.